There are so many good reasons to buy New Order shares. Personal growth is definitely one of them. In a virtuous cycle, Agent Ernst Steinitz was inspired by a fellow member of New Order Logistics and purchased 2,000 additional shares on behalf of his corp. 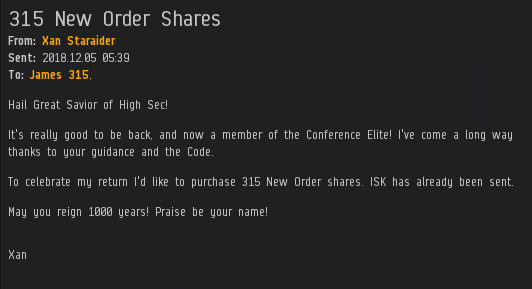 This took us past the 1,622 and 1,623 billion isk marks and earned NOL a Double Supreme Protector's Tip of the Hat™. It also secured NOL's position as the top isk contributor for November. 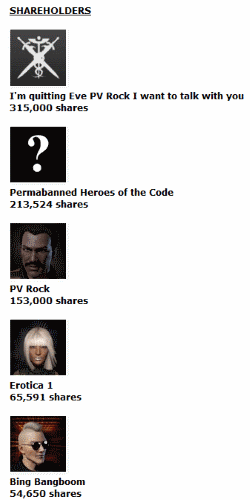 As the new month dawned, Agent Apo123 quietly purchased 1,000 additional shares of New Order stock, taking us beyond the 1,624 billion isk mark. For his dignified, understated act of generosity and compassion, Apo123 earned a Supreme Protector's Tip of the Hat™. Which brings us to the grand finale of today's post. Yes, the inimitable Agent Bing Bangboom. I believe you already know Bing. And, if you live near the Kino system, you've certainly met his ganker alt, Agent Spine Ripper. Bing now owns 54,650 shares of New Order stock. He currently holds the fifth-largest number of shares, which is particularly noteworthy for someone who hasn't quit or been permanently banned from the game. However, Bing didn't buy the 15,000 extra shares just so he could reach the top five. That's not who he is. 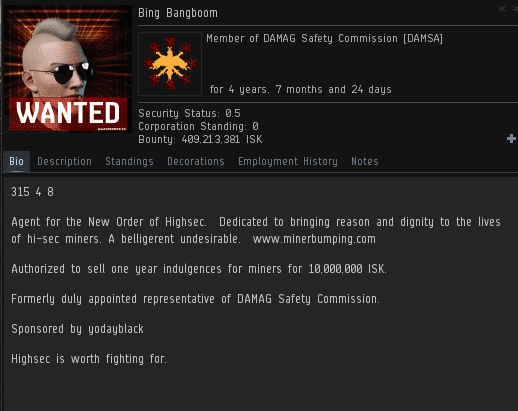 Bing purchased those shares because he cares about highsec. Okay, getting into the top five may have been a factor. But hey, credit where credit's due. Perhaps Agent Bing's example will inspire the next generation of shareholders? Does buying 10 shares in CODE come with a years's license thrown in? Can I purchase multi year licenses to reduce paperwork/avoid expirations? Do you offer a Senior Citizen discount? Vets? Disabled? I love your blog and you kid's are the cat's pajamas to me. You are going to die over and over and over until you go back to LOL. IKR! What's with these guys?!? 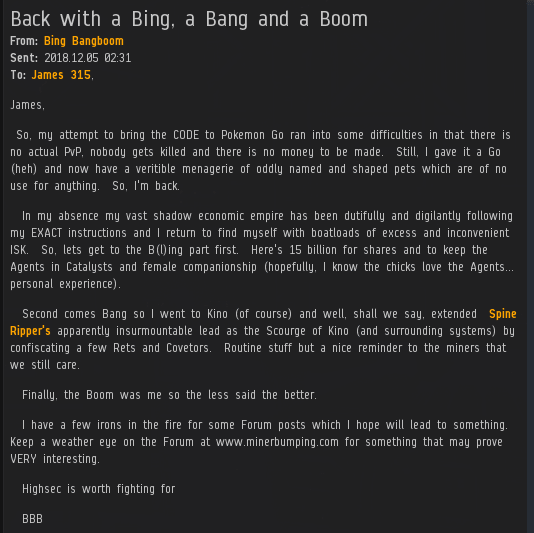 Thank you agent Bing Bangboom, Apo123, and everyone else! You guys keep us in the fight! Looking forward to more BING forum posts.... I hope we can get them pinned straight away! Why Don't the Theme Parkers Love Bots?